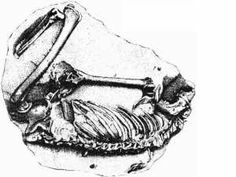 "Guadeloupe Man: W. Cooper claimed in 1983 that a modern skeleton found on Guadeloupe in 1812 had been dated at 25 million years old, in the Miocene period. The excellent condition of the skeleton, and the fact that it had originally been found with other skeletons (all pointing in the same direction) along with a dog and some implements, indicate that it was a recent burial." Text from "Creationist Arguments: Anomalous Fossils"